That's the word on the street in Detroit, a city that is both hopeful and anxious. While Dan Gilbert gobbles up city buildings for redevelopment and Mike Ilitch’s plans for a new hockey arena take shape, Midtown is growing and pockets of the city are enticing new residents. And though city retirees and bondholders fret over the outcome in court, the upcoming bankruptcy trial likely will reduce the city's annual expenses, allowing for more spending on cops, firefighters and city cleanup. Against this backdrop, Mayor Mike Duggan charged into office in January, promising a turnaround that would begin to take shape within six months; a bold approach that has helped earn Duggan a honeymoon, for now. He's vowed to knock down more blighted homes – and increase the number leveled each month. He's called for and gotten more buses on the city's streets. He's overseen sweeping changes in the city's administration, streamlining the bureaucracy that has strangled the city for decades. People remain hopeful. They like what they see, but want – no, demand – more. "I just wish he'd hurry up and put a rush in and get some new buses and stuff because people need to go where they have to go," said resident Talere Anderson. Anderson was talking about buses, but could have been talking about any number of the city's woes – crime, jobs, quality of life. 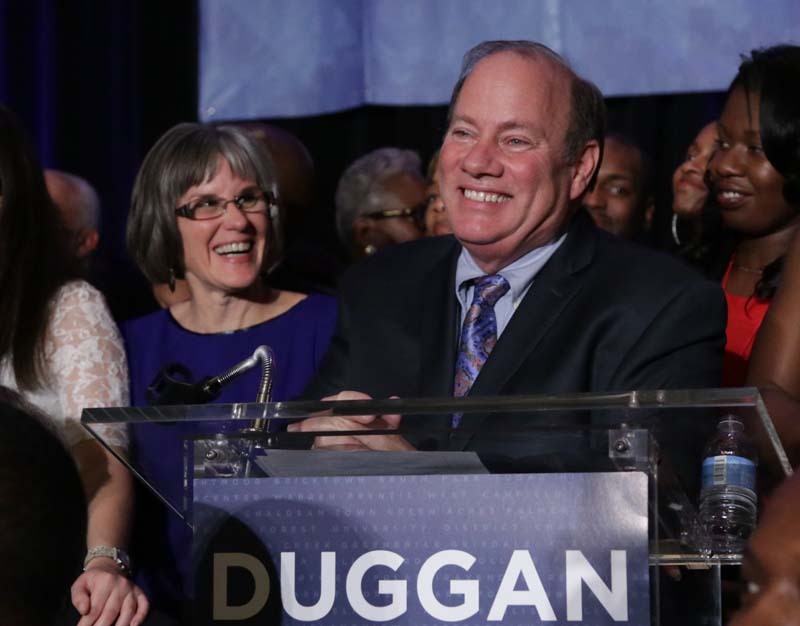 Six months after Duggan challenged city residents to give him a half-year to show what he could do, the Detroit Journalism Cooperative grades his efforts. We see promise across several performance benchmarks that Bridge set in January. Ultimately we agree with the mayor’s own grade – incomplete – because in a city like Detroit, with so much to do, six months isn't enough time to get a final grade. What follows are a series of reports this week by writers from Bridge and our partners at the DJC assessing the city’s progress since Duggan made his bold vow. What we found is a patchwork of views: some see signs of success and others remain frustrated. Yet most people interviewed say they've seen incremental improvements. But more is needed, particularly in neighborhoods – as Duggan himself is well aware. Already, Duggan says the city will soon be knocking down 800 blighted homes a month, up from 500. Yet tens of thousands remain, leaving a process that will take hundreds of millions of dollars and years to complete. More buses are on the streets every day – up to 200 when 150 were there just months ago. Riders still complain of hour-long waits and Duggan's staff says it won't be solved unless the city adds up to 63 more buses. And that includes 50 from the federal government that isn't a done deal. On other measures, progress has been more difficult to gauge – or is outside the new mayor’s control, anyway. The police department is overseen by Emergency Manager Kevyn Orr; the schools by city and state-run school districts and dozens of charter schools. And one of the pocketbook issues Duggan talked about during his campaign – reducing the city’s high car insurance rates – has yet to be addressed. But what Duggan has been able to touch, he's changed, residents and leaders say. The question remains: Will it change fast enough? The Ravendale area is completely. I did not vote for Duggan, however, that does not mean we should be left out of the progress. Residents are living in the middle of high grass, overgrown trees. "They are actually living inside a forest" I am very please with the progress of trash and bulk pick-up throughout the city, but our area must be a part of the progress, not just those that worked on your campaign! The city do not need favoritism, it needs everyone involved!! I have tried to make contact with some of your team with no results. Let's change Detroit together! Toni (President Ravendale Community, Inc.) Please, will someone please look at Harper, Chalmers, Dickerson area! I am sure you agree, residents are living in a forest! Detroit should stop trying to be what it once was and become something new. Stop trying to be a big city. Make it smaller town where people live in a community and are not isolated and separated into pockets. Detroit should sell of some of its land to anyone who wants to develop it for small communities, farming, business, etc. Even consider selling the land to reduce the land size of Detroit. Form a new town.